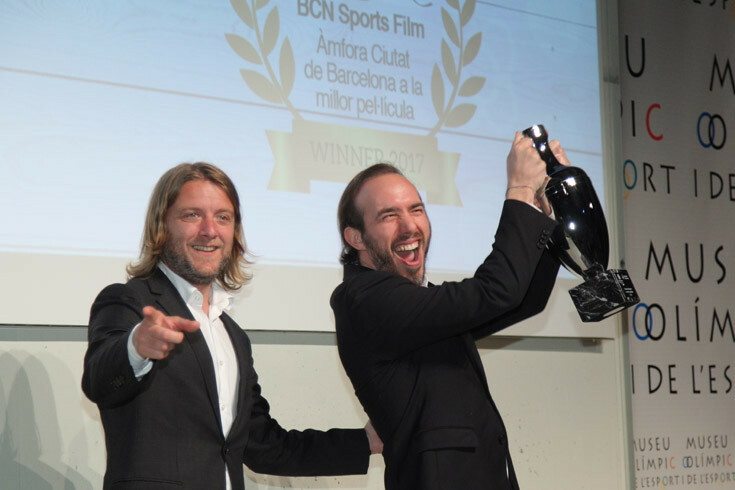 The Closing Ceremony of the BCN Sports Film Festival’s 8th Edition, celebrated in the Olympic and Sports Museum Joan Antoni Samaranch, has been the rallying point between the worlds of cinema, sports, politics and society. David Escudé, President of the Fundació Barcelona Olímpica and Sports Commissioner for Barcelona’s City Council was the person who awarded the Amphora Barcelona City to this edition’s best film ; ‘‘PENALTY’, a fiction shortfilm by Aldo Iuliano and produced by Andrette Lo Conte. ‘Penalty’: A group of young men is playing football in the middle of nowhere. There is much more at stake than simply the pleasure of winning the game. Aldo Iuliano has collected the award. Amphora Barcelona City to this edition’s best film: PENALTY (Italy, 2016). David Escudé, President of the Fundació Barcelona Olímpica awarded the prize to Aldo Iuliano. Special Award of the Jury: NADIA COMANECI, LA GIMNASTA Y EL DICTADOR (France, 2016). Jorge Barrio, Luce Grosjean and Vicky Marcó has awarded the prize to Pola Rapaport the director of the documentary. Award for best Documentary Production: STEVE McQUEEN – THE MAN & LE MANS (United Kimdog i United States, 2015). Joan Villacampa i Galiana, Institutional Vicepresident of CEEB, gave the award to Ehren Schimmel, United State’s Consul in Barcelona. Award for Best Film of Adventure Sports: CHEMINS DE GLACE (Canada and Quebec, 2016). Maite Fandos, Deputy of Social Welfare of Barcelona, has awarded the prize to Claudia Kedney-Bolduc, the director of the documentary. Award for Best Catalan Production – Tarragona 2018: GIGANTES DESCALZOS (Catalonia, Mexico and Spain 2017). José Manuel González Labrador, Sant Boi de Llobregat’s Deputy Mayor has awarded the prize to Iván Roiz and Álvaro Priante the film’s directors. Award for Best-Animated film: PRESTON (France, 2016). Daniela Arónica, Director of the Mostra del Cinema Italià in Barcelona, gave the award to Bibiana Schönhoffer, Menorca Mendit Festival Director. Award for Best Fiction Film: BONIEK i PLATINI (France and Polond, 2016). Jérémie Laurent expressed his gratitud via videoconference. The special award of the jury – Jorge Barrio, teaches film scriptwriting and creativity in the Imval Audiovisual School and holds film workshops organised by the Vitoria-Gasteiz City Council, He founded the Laimar Production Company in 2009 and has produced more than 20 shorts working as producer, director and, occasionally, assistant director ; Marta Clari, is currently managing the Department for Citizens’ Rights, Participation and Transparency within the office of the 4th Deputy Mayor of Barcelona. ; Luce Grosjean, producer and an active member of the AFCA (Association Française du Cinéma d’Animation); Manuel Ibern, a member of the Technical Committee of the International Swimming Federation (FINA) as well as Vice-president of the Catalan Swimming Federation; Vicky Marcó, Television, film and internet Producer – was for the movie NADIA COMANECI, LA GIMNASTA Y EL DICTADOR (France, 2016), directed by Pola Rapaport and produced by Roche Productions. Accepting the award was director Pola Rapaport. This year the jury awarded a special mention to the shortfilm WE ARE THE SUPERHUMANS (United Kinkdom, 2015), by Douglas Wilson. Blink Productions production. GIGANTES DESCALZOS (Catalonia, Mexico and Spain 2017) by Iván Roiz and Álvaro Priante. Produced by Holidays Film and MM4 Producciones. Jose Manuel Gonzalez Labrador, Sant Boi de Llobregat’s Deputy Mayor has awarded the prize toIván Roiz and Álvaro Priante, the film’s directors. BONIEK i PLATINI (France and Polond, 2016) by Jérémie Laurent. A production by Joanna Sitkowska (Grec – Groupe de Recherches et d’Essais Cinématographiques). PRESTON (Francia, 2016) by Gabriel Amar, Louis Doucerain, Joseph Heu, Marcere Térence Tieu and Morgane Vaast. Produced by ISART Digital. Daniela Arónica, Directora de la Mostra del Cinema Italià de Barcelona, gave the award to Bibiana Schönhoffer, Menorca Mendit Festival Director. Award for est film of adventure sports – CHEMINS DE GLACE (Canada and Quebec, 2016) by Claudia Kedney-Bolduc. Produced by Spira Films. Maite Fandos, Deputy of Social Welfare of Barcelona, has awarded the prize to Claudia Kedney-Bolduc, the director of the documentary. Espartac Peran, was the master of ceremony in this 8th edition.